Groundzone Tree Care can safely remove any tree in any situation. Difficult tree removals are one of our specialities. Its all about cutting down trees safely! We will use the latest equipment and tree removal techniques to safely and carefully remove your tree. Even if your tree is overhanging houses, fences, gardens or anything else we will remove it without causing any damage. Do you have trees that need felling? Groundzone Tree Care can safely cut down trees of any size. We will use tree felling wedges, or cables and machinery to fell your trees. Tree felling is usually carried out in open areas like farms, parks, and large gardens. We don’t just remove large trees in difficult places. We also cut down and remove small trees, shrubs and hedges. There are no trees too small or too large for us to remove. WHAT HAPPENS TO THE BRANCHES AND THE WOOD? 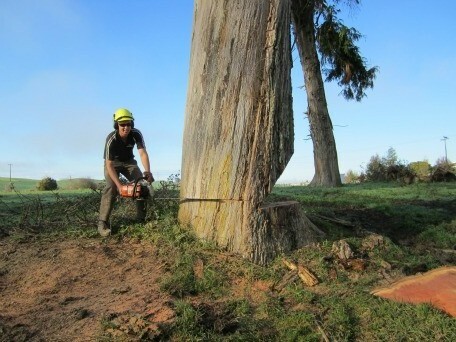 Part of our tree removal of tree felling service is chipping. The branches from the trees and shrubs we remove are put through a chipper. We can chip branches and logs up to 9 inches in diameter. The chipper discharges the chip into our truck. We can then very easily take the chip away, or tip it off on site if you would like to keep it for garden mulch. This is a very efficient and cost effective way to take away a large volume of branches in a very short time. If you would like to keep the firewood from the tree, we can cut it into rings for you. We even offer a firewood splitting service. If you would like the wood taken away, we can usually arrange for a firewood merchant to take away the wood for no charge.